November 3 – Most of the talk of World War 3 this past week centered around 1- speculation; 2- incursions by Russian air units; 3- the purposely-obtuse notion that a third world war would not slow down world population growth; and, 4- a Russian military drill simulating an attack on Denmark. The number of stories mentioning World War 3 took an upturn, but it was due to one o the four issues listed above. Even EBOLA scare stories slowed to a steady grind. This was the fifth straight week for the “EBOLA in AMERICA” Corporate Media campaign. Russia’s Vladimir Putin continues to rattle his sabre. Not much else happened–at least publicly. 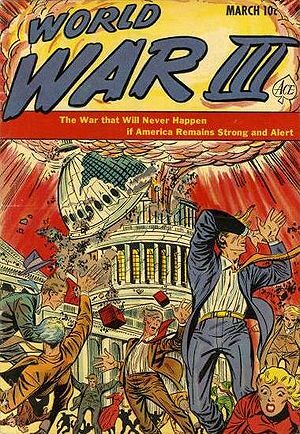 NOTE: When World War 3 does break out, it will not be announced in advance by any of the sites currently churning out World War 3 melodrama. SPECULATION: When major media accounts of World War 3 cease, that is the time it is most likely to occur. Again, it’s not a matter of IF, it’s a matter of WHEN. World War 3 will happen. But (like last week) those weeks did not begin with this past week. There’s a 35% chance of World War III; which is no change%. This is not because of any peace efforts. The month-long drop is not due to any slackening in worldwide violence. November 3, 2014 –The world is in a “quiet” period. Of course, if one is living in Iraq, Syria or parts of Ukraine, there is no quiet. But for the world at large, the last three months have been fairly peaceful. ISIS and Syria have been pushed down the media’s pecking order. This does not mean that these two countries have gone away–only that media attention is not focused on them. This usually means that some new event will be necessary to refocus the world’s attention. Alternate Corporate Media and social media pre-war propaganda continues at a very steady rate. Further government controls on cash, movement and liberty are also likely. In the meantime, the US government pretends it is powerless to stop the “flood of jihadis” coming across the USA southern border. This is, of course, part of the narrative. CONCLUSION: Once more this week: not a lot of change. Again this week – The only thing holding back war is the time table. It appears it is not quite right yet. There is still more fear to promote and other themes which need a bit more time to develop.